Once you arrive in San Juan, rent a car and drive straight out of town to the Southern shore of the island and get settled in Ponce before exploring. There's nothing wrong with San Juan, you can spend a couple of days there before you leave. It's the big city, so to get a taste of the real Puerto Rico head on out of town and prepare to be delighted. The extraordinary mix of architectural gems in Ponce. 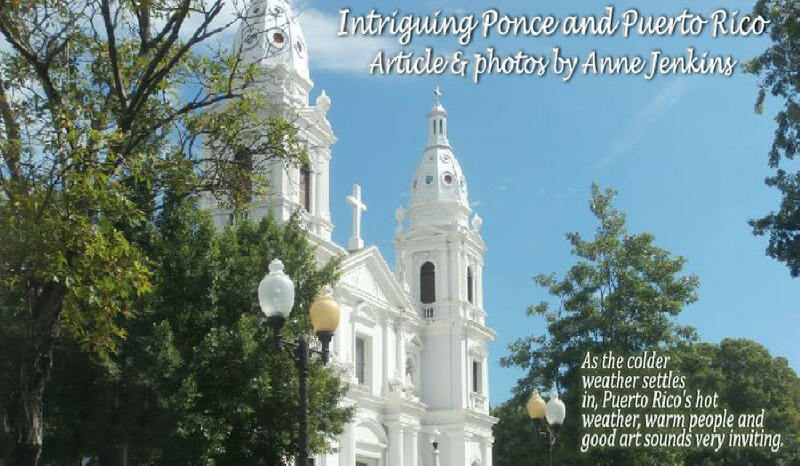 Ponce, the "Pearl of the South," is a grand dame of beautifully preserved and restored buildings with cool, shady squares and fountains reminiscent of Europe. The vibe is elegant and laid back. The locals are very welcoming. And the art - visual, architectural and culinary, is outstanding. The European style squares with fountains, public art and shady trees. The Plaza las Delicias, is the central main square and a good starting point. And it's home to the most extraordinary fire station, Parque de Bombas. The whole building is a jumble of red and black stripes.The colors make it very "heavy" but it's a fun challenge to sketch. There are plenty of benches, shady trees and the place is crowded with subjects to sketch. The Parque de Bombas, probably one of the most photographed buildings in Puerto Rico. Ponce's symbol is the lion. In 2012 they started a public art project of life size lion statues placed around the square. Each one is painted by a local artist, and they are just such fun to explore. Each one is a work of art, some have a great sense of mischief, others majesty. 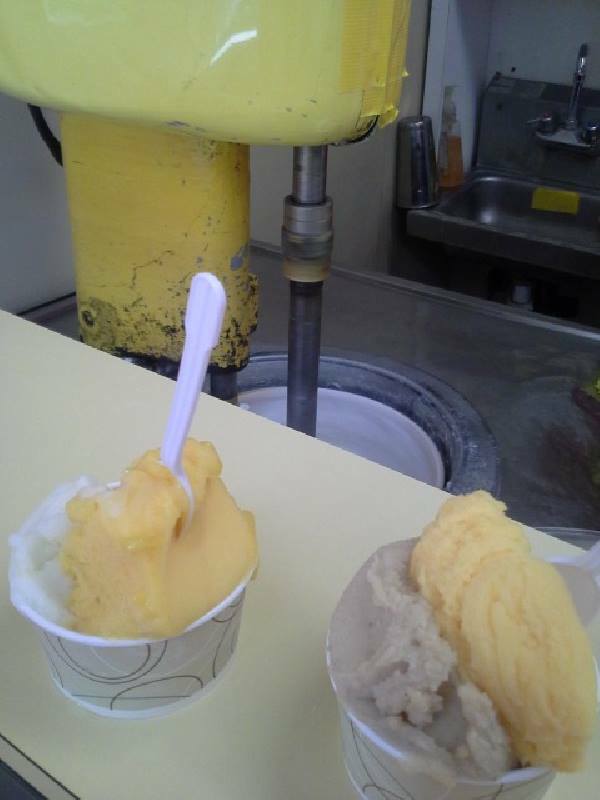 Pop over the street, choose a refreshing ice sorbet from the hole in the wall, King's Cream, to slurp while you cool off under the trees of the park. There is a souvenir shop opposite the Parque de Bombas called Mi Coqui Souvenirs which is full of the usual stuff peddled to tourists. But this one has an extraordinary hidden gem - ask to see the art gallery. You are led through the back stock room, up some uneven stairs and a door is unlocked to reveal a treasure trove of local art hanging on the walls and stacked on the floor. The 2 vejigante masks by one of the most famous mask makers. When I was there they had two very big and beautiful papier mâche folk art masks, the vejigante masks, made by one of Puerto Rico's premier mask makers. He is getting on in age and probably won't be making many more. I wished I could take one home. The masks are worn traditionally during carnival by costumed vejigantes who roam the streets with the idea they'll scare sinners back in to the arms of the church. 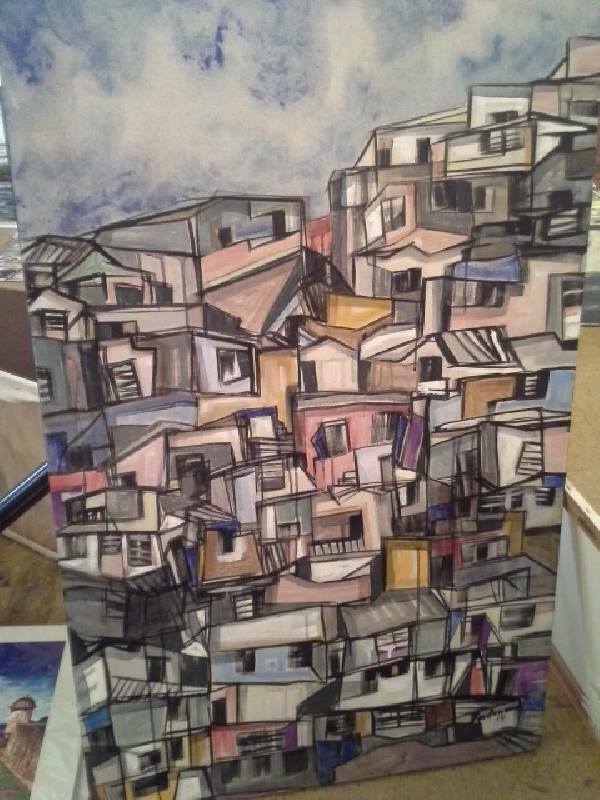 A lovely rendition of the houses in Puerto Rico towns tumbling down the hillside by a local artist. The owner of the store, David Maldonado took me up to the gallery and when I asked him how this Aladdin's art cave started. He smiled and said he loves art and has always collected. So he decided to open a gallery. I am so glad he did and I hope he makes it easier to access because it is an amazing place and at present has no outside publicity at all. 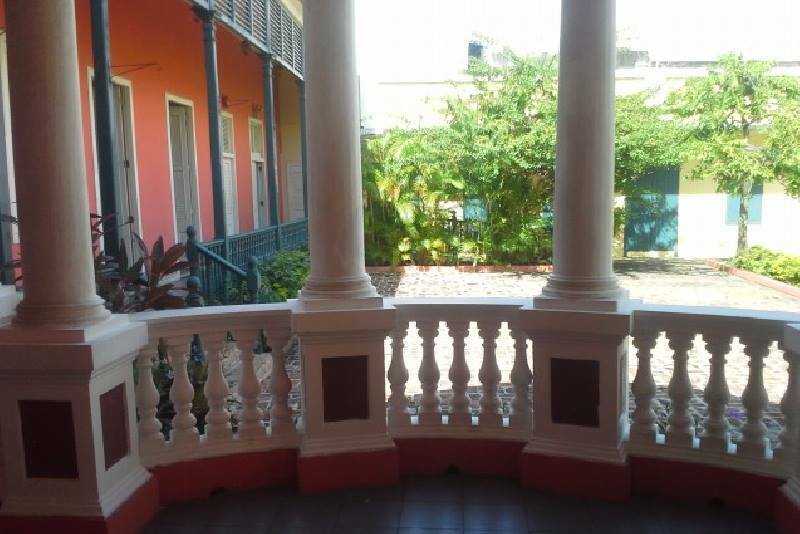 Wander a couple of blocks up a side street from the square to the Centro Cultural de Ponce Carmen Solá de Pereira. It is housed on Calle Cristina in a wonderful apricot colored restored mansion with a cool central courtyard. The main function of the center is to promote local artists, further arts eduction and many other cultural activities. They often conduct painting lessons on the front porch and have constantly changing art exhibits on display. After a warm welcome they encourage you to wander about at will and leave you to enjoy the art and the lovely building. 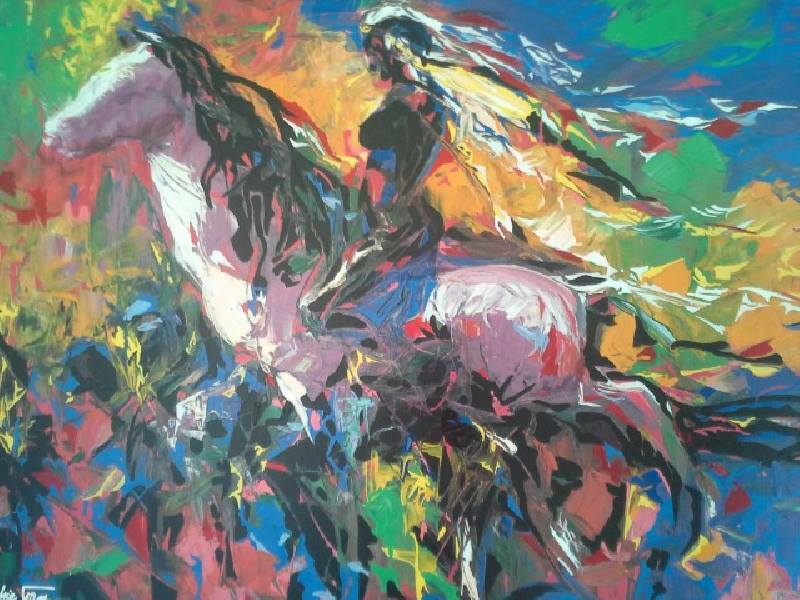 'Caribe' by Wichie Torres and Eli Vega, one of the paintings on exhibit in the Centro . It's not near the center of town but it is definitely worth making an effort to get to the Museo de Arte de Ponce. This museum is the premier art museum in the Caribbean and it is exceptional. What started out with a small collection of about 70 paintings, it is now considered to be a world class art museum of approximately 800 masterpieces. It's housed in a building designed by the architect for the New York City Museum of Modern Art and Washington, D.C.'s Kennedy Center for the Performing Arts, Edward Durrell Stone. 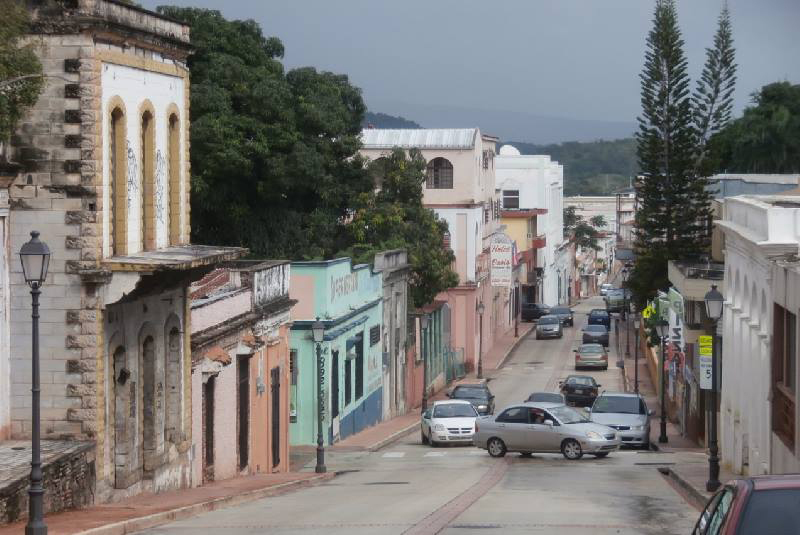 The town of Ponce is an art collection in itself. Many of the buildings have been restored to their former glory and the narrow streets with their eye popping architecture is a joy to wander around. I recommend, if you have the time, to head to the coast and in to the hills for a day for two. There are some lovely beaches, a couple hidden down bumpy dirt roads. The hill towns are great to explore, One of those less touched by modern tourism filled with restored historic homes and squares is San German. Another fascinating town architecturally with colorful houses built like mosaics on the hill side and gracious mansions in town is Yauco, once the major coffee town in the world. The graceful historic hillside town of San German. There is so much more to explore and discover all over the island. Puerto Rico is not very big so getting around is easy. You will be warmly welcomed. And you'll eat way too many of the yummy snacks and food from stalls and food trucks on the side of the road. Go soak it all up and enjoy ... the island,and it's art, is glorious. The art teacher on the porch inviting us in to join them in Ponce.